RIME is a brand new science fiction novella. It’s due for release as an exclusive ebook on 27th June from Venture Press. So, where did it come from? I’ve always loved the epic Rime of the Ancient Mariner. Iron Maiden have a lot to do with that. 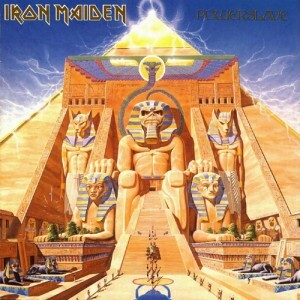 I remember being in school when their Powerslave album came out, featuring their song based on the poem, and every day we’d pile into school and ask our mates how many times we’d listened to it the night before. I still love it now (in fact, I listened to it only yesterday), and for a long time I’ve considered writing a science fiction novella inspired by the poem. The chance came when I decided to try writing something longhand. Now, anyone who’s seen my handwriting will already be guffawing at the mere idea of me picking up a pen. Sometimes even I have a problem reading my own writing (true). But I’d been thinking for a long time about how writing something longhand, instead of sitting at a computer, might change the creative process. So armed with a couple of new notebooks––and like most writers I love empty, fresh notebooks––I left the house and hit the cafes. Rime probably cost me a hundred pounds in coffee and cakes to write, but it was a fun process. The books filled quickly, the story flowed, and I sensed that my writing style was somehow streamlined simply through the process of brain-finger-pen instead of brain-keyboard. Maybe that’s because I wasn’t constantly going back and correcting what I’d written (I’m a 4 fingered typist, which necessitates frequent pauses to correct what I’ve typed). When it was finished, I left the novella for a while and moved on to other projects. This is also something I don’t often do anymore, and it did the story some good. By the time I knew I wanted to work with Venture Press, and told them I had the perfect project, it had been a while since I’d written Rime. Typing it up, revising, editing, was a revealing process, and I’ve ended up with a novella that makes me very proud. 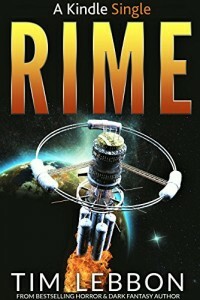 Rime is the first Tim Lebbon book I’ve read. Really good storytelling with some great ideas. This would make a fantastic movie! I agree! And thanks. Who knows what might happen.